I can't remember the last time I cried, well certainly not from sheer terror. But, after going to see The Factory, I have joined a list of people, men included, who have been broken down to blubbering, weeping wrecks during the Fringe performance. I managed to last 12 minutes as an "Auschwitz victim" in a dark tunnel under The Pleasance before I made my escape. I actually feel quite sick even recounting the experience and admit that I declined a phone conversation the next day with the lead character because I felt, irrationally, absolutely terrified of him. 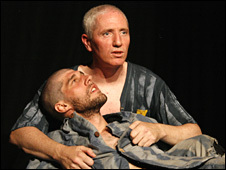 The Factory, a production by Badac Theatre Company, recreates the last hour in the life of prisoners at Auschwitz-Birkenau. I knew to expect suffering but this was too realistic. We were surrounded by the actors, there was no safety zone or distance between the audience and them. We were made to stand in two small rows, one in front of the other, in a long, dark tunnel in the venue's vaults before a metal roller door was closed down behind us. About six men and a woman then started screaming and swearing and ordering us about. They were behind us, in front of us and all around us. They had shaved heads, were brandishing metal clubs and were extremely menacing. The actors then started smashing the clubs against sheets of metal attached to the stone walls, which made a deafening noise for 10 minutes. And, while we were in this noise-like torture, the men were also taking turns to march up and down and come up to members in the audience in a threatening and terrifying manner. I was rooted to the spot and I remember trying hard not to flinch, or even breathe, in case my movement caught their attention. I tried to reason with myself by thinking, "they are just actors", but they were just too convincing and I could actually feel my heart pounding. The noise and the intimidating men enveloped me and I became more and more anxious until I suddenly managed to make a run for the door, which was being opened for a man who was also fleeing. And then I just started to cry from the sheer shock of the experience. After the show, my colleague told me she was taken down some steps into smaller and smaller rooms while being screamed at before some of the actors took all their clothes off and ordered the audience against the wall as the onslaught of fear and intimidation carried on relentlessly. I have since learned from a leading clinical trauma psychologist, Dr Matthias Schwannauer of Edinburgh University, that my reaction was not weak or wimpy as I have feared people would think. He said: "If you flood people with noise and move towards them it increases their physical threat as the brain is subjected to a multi-sensory impact. "This does not evoke sympathy because there is acute threat and, instead, the reflective part of the brain is shutdown and you can't reason that it is not real. "The extreme noise causes the brain to feel confused and I know some people who would be tipped over the edge from this show. Your reaction has been similar to that of a trauma victim." A spokesman for the show said: "This is a violent, very brutal and noisy show and people have found it too much and left. "The aim of the piece is to make people feel how these prisoners must have felt. "It is a very confrontational piece of theatre and is very realistic so we have asked the box office to warn people when they buy tickets."